A few weeks ago in Claudia's preK class, they had a "family" unit. 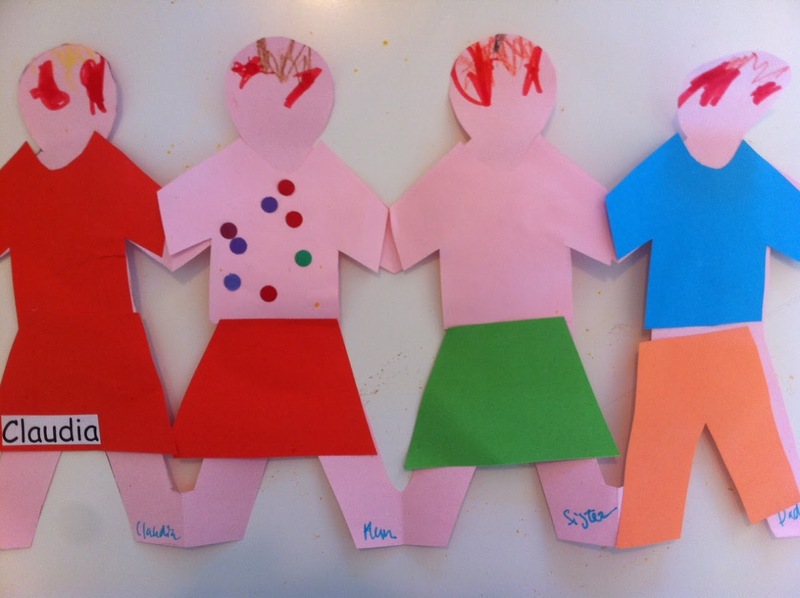 This paper doll family was one of the art projects they did. Notice anything strange? Hint: Patrick is wearing a skirt and is labeled "sister." Claudia has been telling everyone that Patrick is a girl and that Patrick is her baby sister. I've got to hand it to her. She just doesn't give up. She wanted a sister and she's going to stick to that. For Patrick's benefit, I will now post pics of him doing very many things. Here Paddy is, watching ESPN Red Zone with Daddy. Let me disclose this, though; I don't usually let Paddy watch tv, let alone ESPN Red Zone. But he has been so sick this past week with an ear infection, that we pretty much let him do anything that would keep him from crying. And that included watching ESPN Red Zone. Daddy let him try a Budweiser. The Czech one. The American one is way too expensive over here. He liked it! Daddy assured me the alcohol would help kill off any nasty bacteria or viruses. Poor Paddy's cheeks were so red from the fever. Feeling better, Paddy played a little b-ball. Nothing but net. And a little rim. And a little backboard. He got his little arm stuck in the rim too. Bless his little heart. Then he really showed the rim who was boss. Like I said, he's so manly. His new game on sunny days... crawling after his shadow and slapping it. It's so sunny in our living room, he has to wear a hat to keep the sun off his already rosy cheeks. so...how about that little sister??? tee-hee!